Call us crazy, but we’ve always thought it would actually be pretty cool to find yourself in one of David Lynch’s movies. And the scene in Mulholland Drive‘s Silencio, when everything changes, remains one of our all-time favorites. (Our all-time least favorite? Bob hiding behind the bed.) So we’re doubly excited that the lovably odd director/painter/musician has opened a club in Paris based on and named after this famous scene. The designer on board, Raphael Navot, was part of a large team that included Arnaud Frisch, best known for his Social Club, ENIA architecture studio, and light designer Thierry Dreyfus. 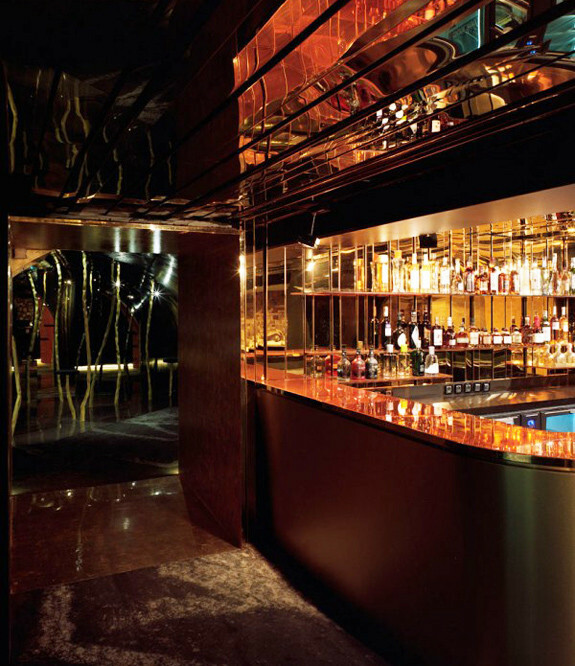 Located in the heart of historic Paris, Silencio is a 2,100-square-foot members-only nightclub that consists of a series of one-off rooms, plus a live stage with a reflective dance floor and 24-seat cinema. It grew, Navot says, out of a two-year process working with Lynch in Paris and in Los Angeles at the director’s home, with talks over the phone or on Skype. “He has a natural director attitude,” Navot tells Co.Design. “Often, the design was guided in a way that was not always figurative–it could have been a drawing, a rough sketch, an expression, or a feeling.” Once he knew how the space would be arranged, Navot would try to create a series from each drawing: “Black Birds” is a series of asymmetric black-leather seats and tables; “Wire” is a collection of seats and sofas. The bar and lounge also include carpeting with edging designed by Lynch.